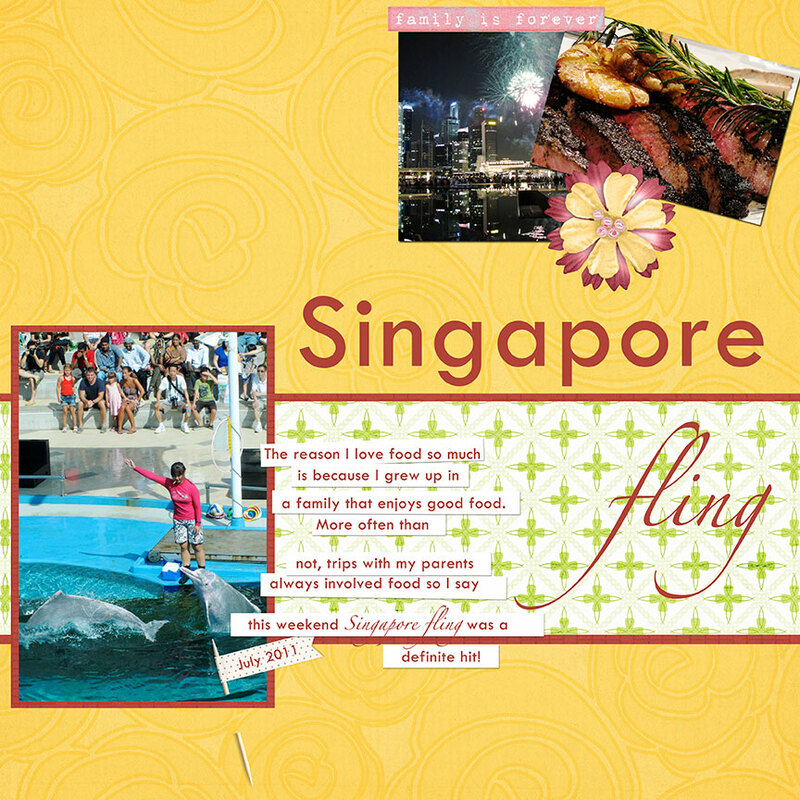 This year, 68 of my family members from all over flew to Singapore for a grand reunion. 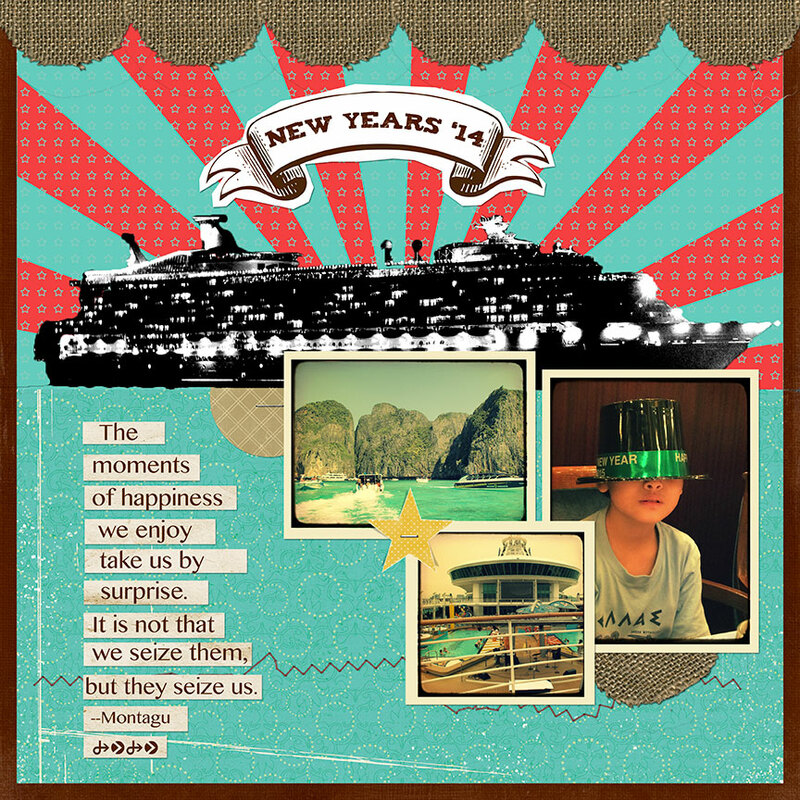 For the first time, brothers and sisters, aunts and uncles, cousins and second cousins took the time and effort to fly from all over and spent New Year holidays together, on the high seas to boot. 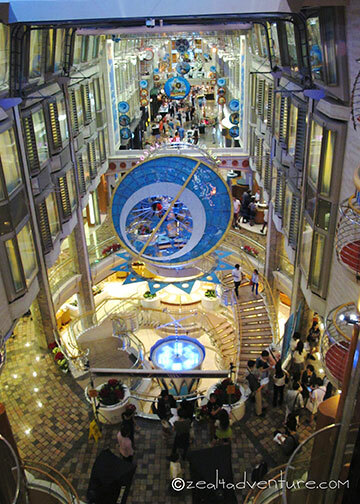 A perfect venue, truth to tell, as none of us could go very far—not saying though that the ship isn’t big and off-shore excursions aren’t aplenty. It was contained enough to allow us to catch up. Some met each other for the first time. So the destinations weren’t great, they weren’t total disappointments either. Our first port of call was Port Klang. 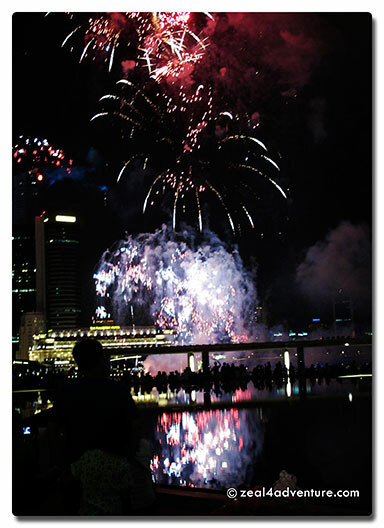 What is there to see in Port Klang, the principal port in Selangor state of Malaysia? Nothing much though we heard that it is a haven for local foodies—good enough for us (by us I mean my immediate family). 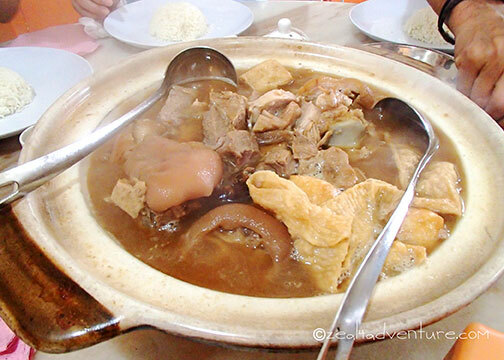 Seafood aside, Klang is famous for its Bak Kut Teh, in fact they say that this pork rib soup which has become a staple in Malaysia, Singapore and some parts of Indonesia started here. Considered a breakfast food, BKT, as locals call it, is pork ribs (or other parts of the pork meat) slowly simmered in an herbal broth. 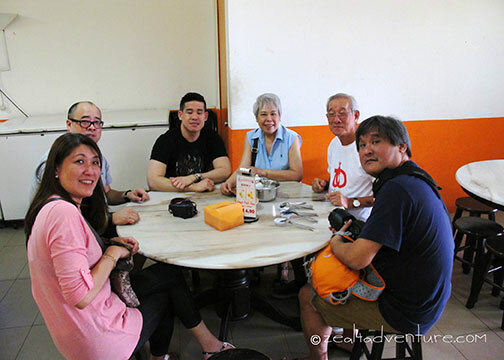 Across the AEON Bukit Tinggi Shopping Center, about 30 minutes away from the Star Cruises Terminal, we randomly chose Restoran Bak Kut Teh. A small shop sans the fanfare – open air and round tables and stools to sit that serves (in my opinion) quite a good and (I assume) authentic BKT. The Bak Kut Teh has an herbal taste (of course), salty with the hint of sweetness; meat was falling off the bone. Extremely enjoyable with soy sauce, garlic and a bit of chopped chili. 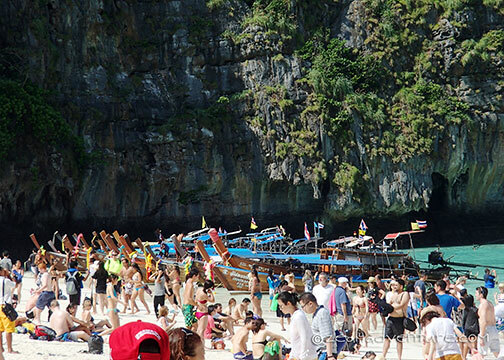 Next port of call was an overnight in Phuket. Arriving Phuket at 11AM, it was too late to do much so we decided on a late lunch in Old Phuket Town and a massage after. We took the tender to Patong Beach and haggled with one of the many vans peddling their services to take us to town. 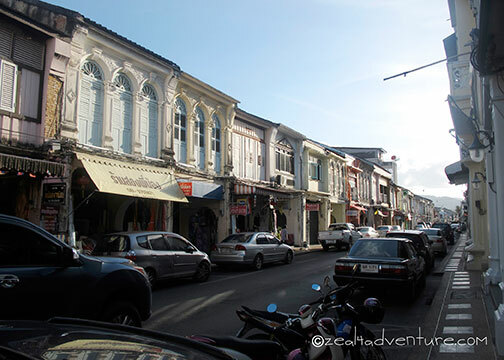 Old Phuket town shines with personality with its rich history. 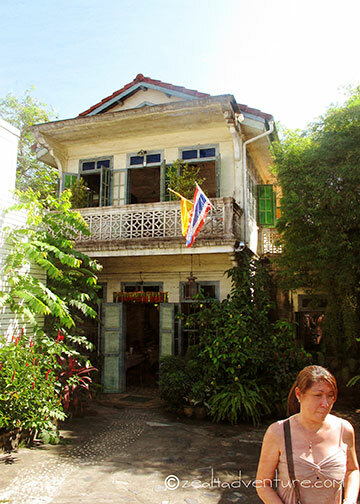 In this old quarter, you will see beautifully ornate old shophouses, quaint cafes, Buddhist and Chinese temples, and some grandiose Sino-Colonial mansions once occupied by Phuket’s tin barons of years ago. 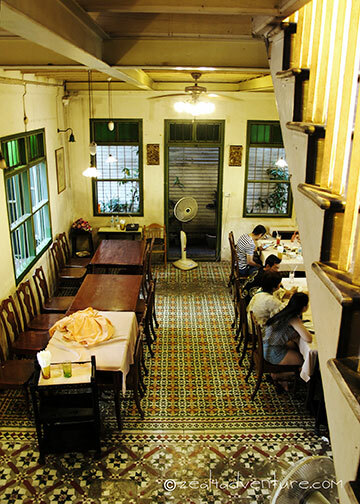 In the middle of town, on New Dibuk Road is a two-storey Sino-Portuguese house converted into a restaurant. 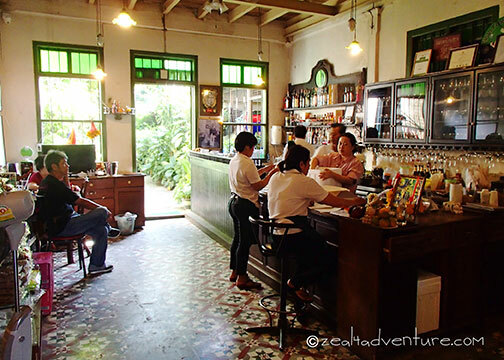 and an antique bar, this old house exudes old colonial. The food, known to be THE Thai restaurant in Phuket; its specialty is said to be the Crabmeat Curry served with rice vermicelli. Being a sucker for all things crab, this was a definite winner. Big chunks of crabmeat and the strong curry muted by the addition of coconut milk produced a subtle creamy curry dish. 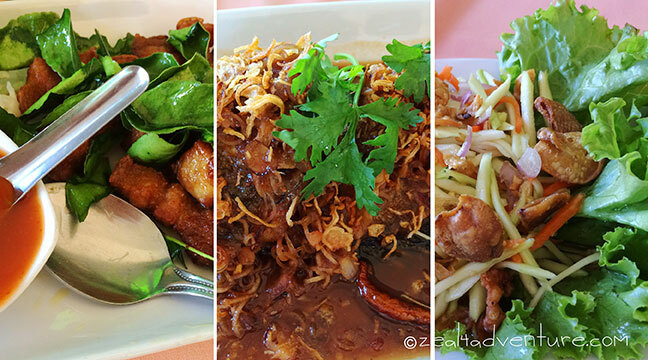 The deep-fried sea bass with shallots and red chilies in tamarind-lemongrass sauce and the pork with Kafir leaves were fantastic too. When in town, do visit Raya Restaurant if you can. We could and should have walked around town, but we opted instead for a massage. 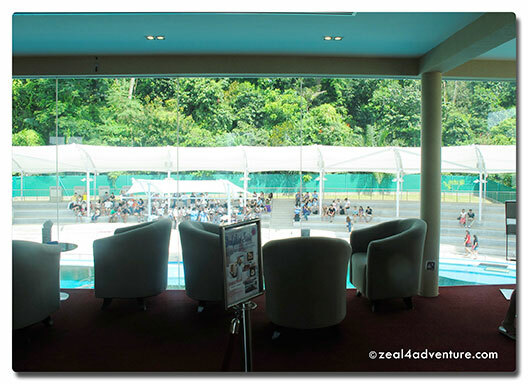 We could and should have gone to the spa just around the corner from Raya. 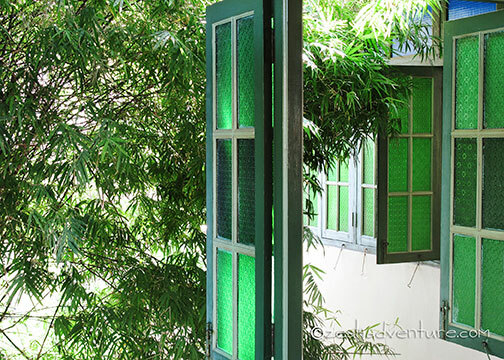 On a previous trip (a post I still owe) the boutique hotel I stayed in offered a discount at The Raintree Spa when booked through them. 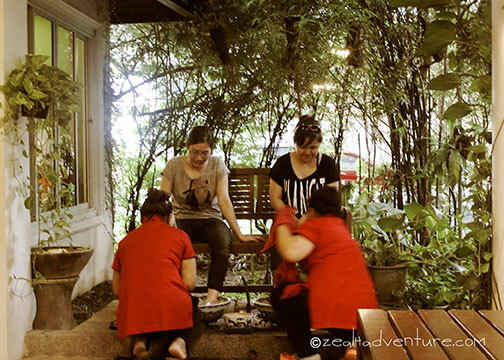 It was most satisfying, in all the right ways—service, skills, and ambiance. I should have known better than to indulge our driver but, hindsight is always 20/20, so yeah… We could have saved the 30-minute drive to the spa he recommended (name and place I won’t even bother to tell) and used it to walk around the charming old town instead. And to think, I convinced my whole family to that massage. 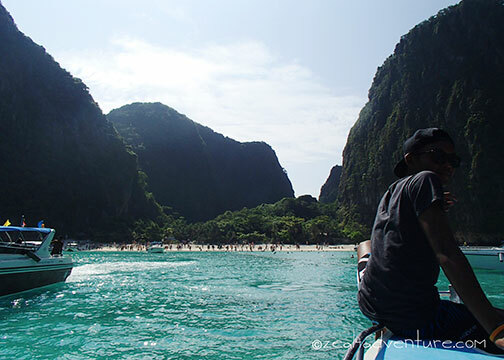 Thank goodness for Phi Phi Islands. 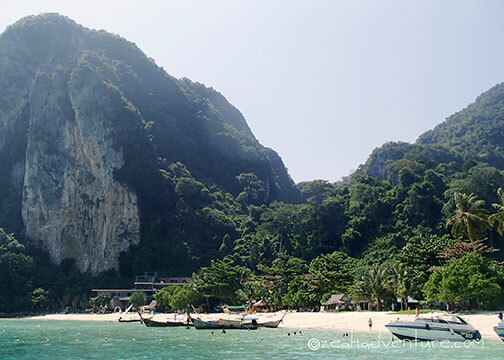 Praised as one of the most beautiful beaches in Southeast Asia, thanks to the film “The Beach”. 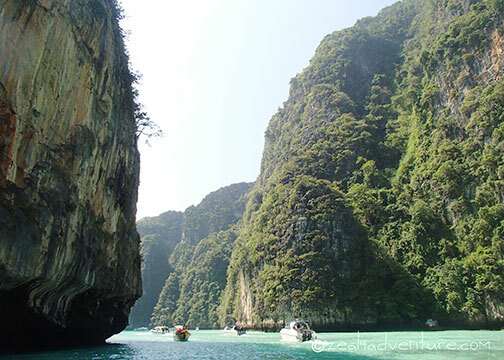 A 45-minute bumpy (because we decided to sit in front) speed boat ride from Phuket, the Phi Phi archipelago comprises 6 islands boasting of white sand beaches, stunning limestone cliff and turquoise water, many parts ideal for snorkelling. Popular with backpackers even before the movie, but the world seemed to have flocked here after the film was shot in 1999. In spite the crowd, the limestone outcrops that swept the archipelago still impressed. 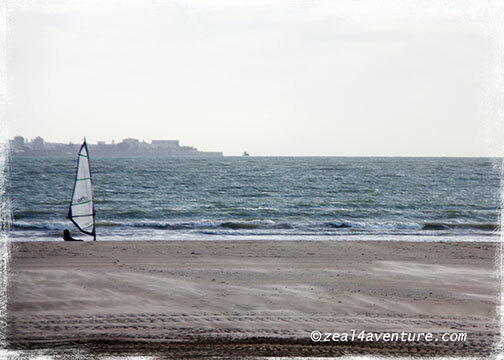 Bounded by the sea on a narrow wedge of land is the province of Cadiz, said to be Europe’s oldest inhabited city. 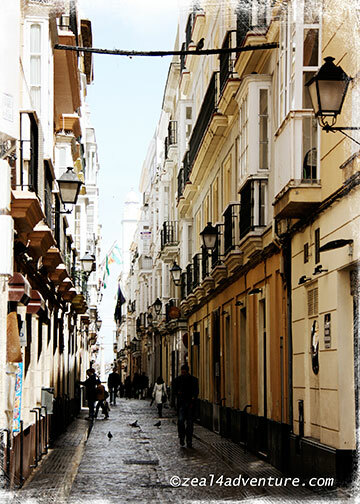 A typical Andalusian city with a wealth of well-preserved historic landmark in its charming old quarter. It may not have architectures that shout “look at me!” like Barcelona’s Casa Batllo, Bilbao’s Guggenheim, or Granada’s Alhambra, but the Moorish looking old city offers a taste of the great days of the 17th century. 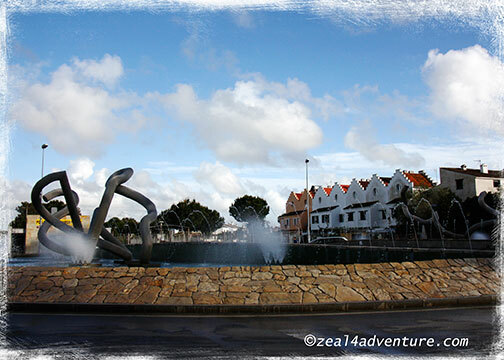 Walk around its cobblestone narrow, winding alleys and open squares and you will feel like nothing much has changed. 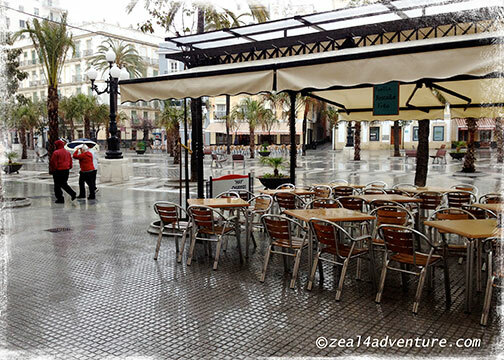 This and the easy-going, everyday vibe of Cadiz makes for a pleasant walk around the ancient city, the rain notwithstanding. Friendly locals would always strike up a conversation, if you speak Spanish that is; otherwise a welcoming smile is always at the ready. 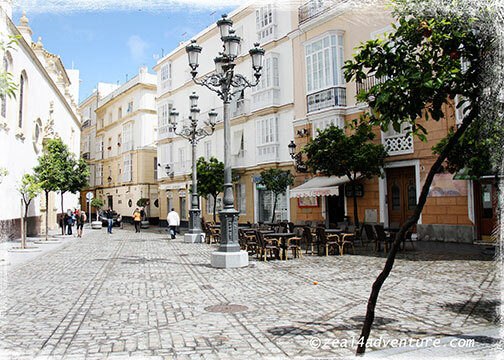 Founded as the Phoenician port of Gades a millennium before Christ, Cadiz has an old and interesting history. 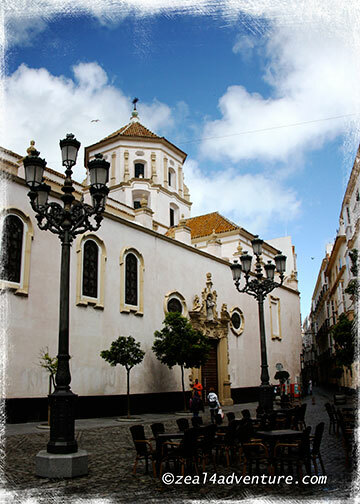 A worthy place to learn more about it is at the Museo de Cadiz, on Plaza de Mina. 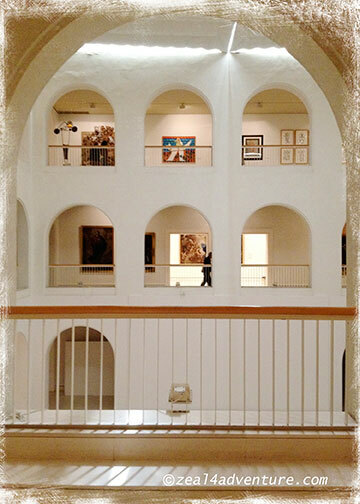 It offers a journey that goes from Phoenician and Roman culture through to the 20th century Spanish paintings. Just across Cadiz is El Puerto de Santa Maria, our home for a few days. 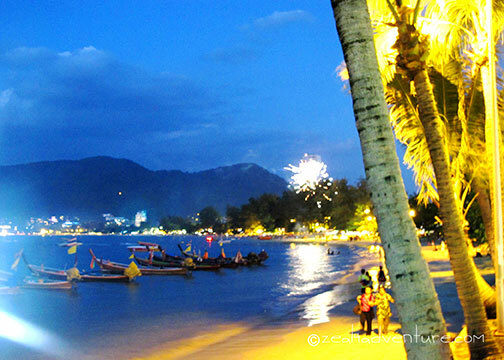 A lively harbor town and beach resort during the summer. It was quiet, however, when we there in April. 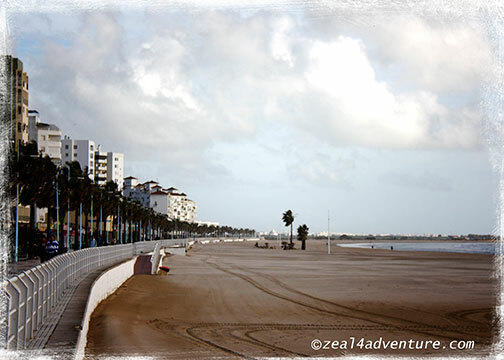 We’d walk around and end up at La Playa de Valdelagrana, the beach closest to where we stayed. 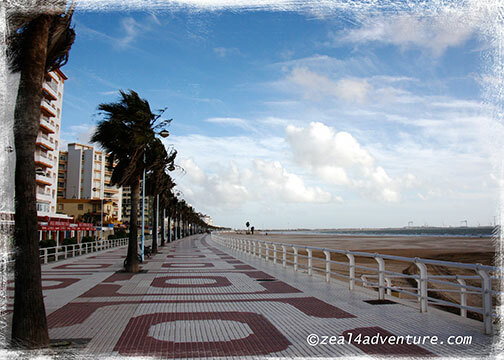 It is one of the Costa de la Luz beaches facing the Atlantic Ocean. The various cafes, restaurants and pubs dotting the promenade are a telltale sign that this playa can be very busy during summers. Never on my radar, if truth were told, but thanks to Anton for wanting to visit his roots, I am happy to have made it to Cadiz. 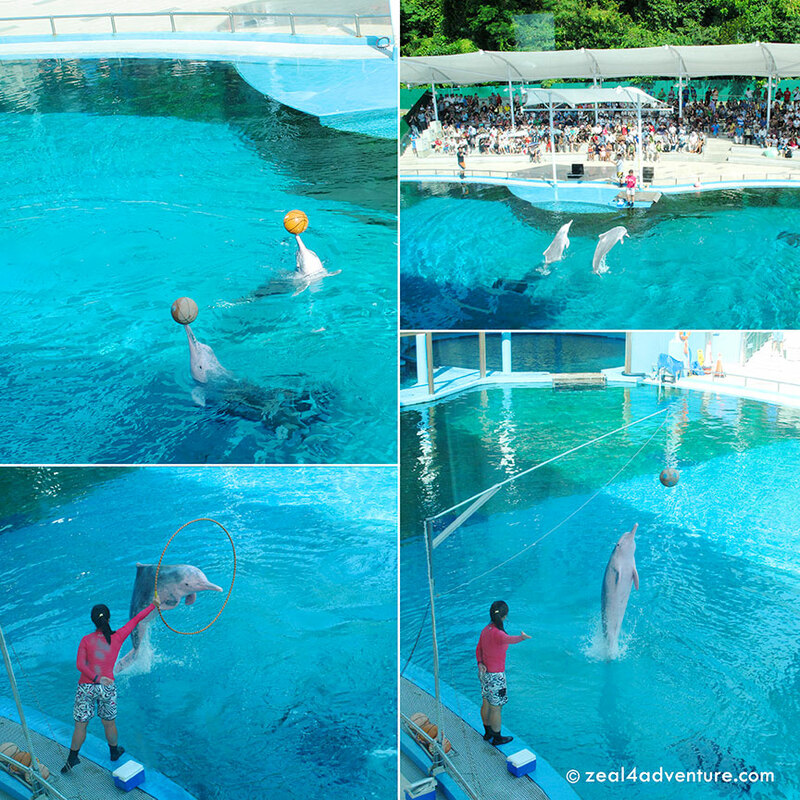 We had the grandest of time chilling as activities get halted every afternoon for siesta. Nothing beats excellent home cooked meals coupled with fantastic stories shared till the wee hours of the morning. 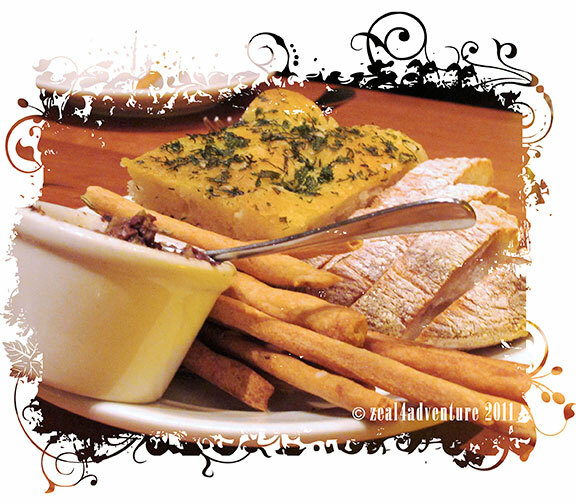 Credits: Papers by Queen of Quarks; Elements from Scrap Matter’s Life’s Little Surprises kit and You Are Awesome Kit by Crystal W.
Daniel Boulud’s Bistro Moderne, Mario Batali’s Mozza, Boon Tong Kee’s Chicken Rice… all part of my dad’s 70th birthday celebration. 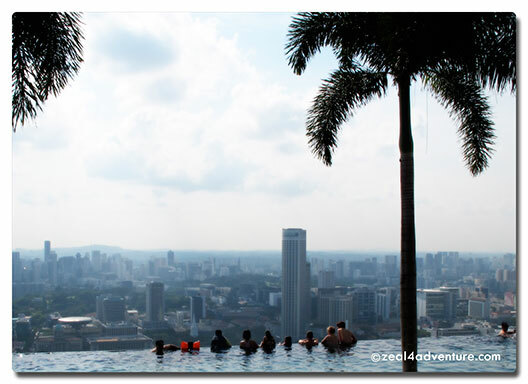 Our whole family of 8 flew to Singapore in lieu of a big celebration and could be the best decision ever. Not all with favorable reviews, I’m afraid. 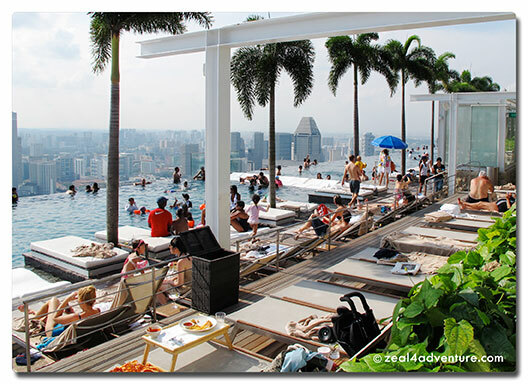 The Marina Bay Sands was a let down. 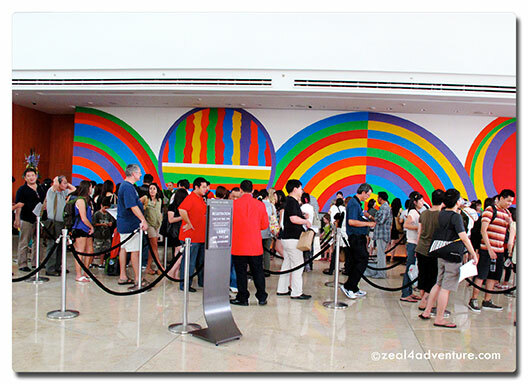 The long lines at the check-in counter had me by surprise, and after that long wait, one of our rooms was not even ready. 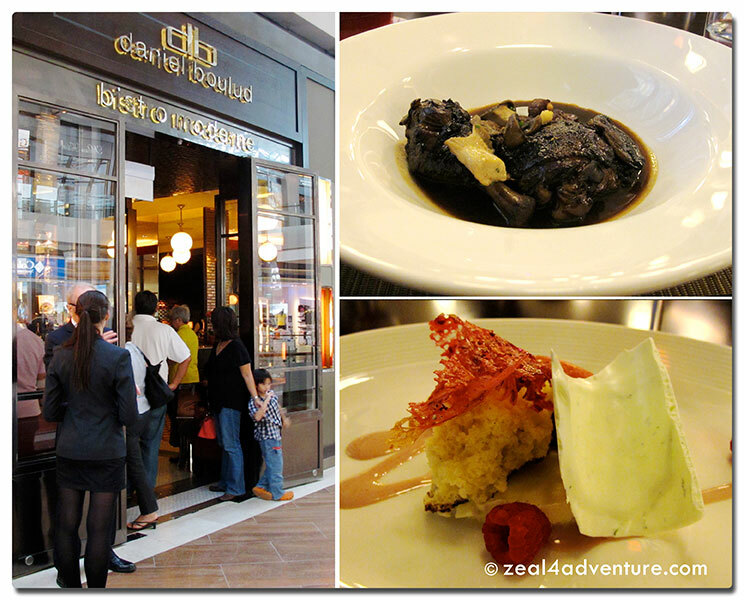 Dinner at DB Bistro Moderne was superb, I had the classic Coq Au Vin and a Yuzu flavored ice cream dessert. The pizzas at Pizzeria Mozza, I truly enjoyed. I also had my first Burata here. Yum. 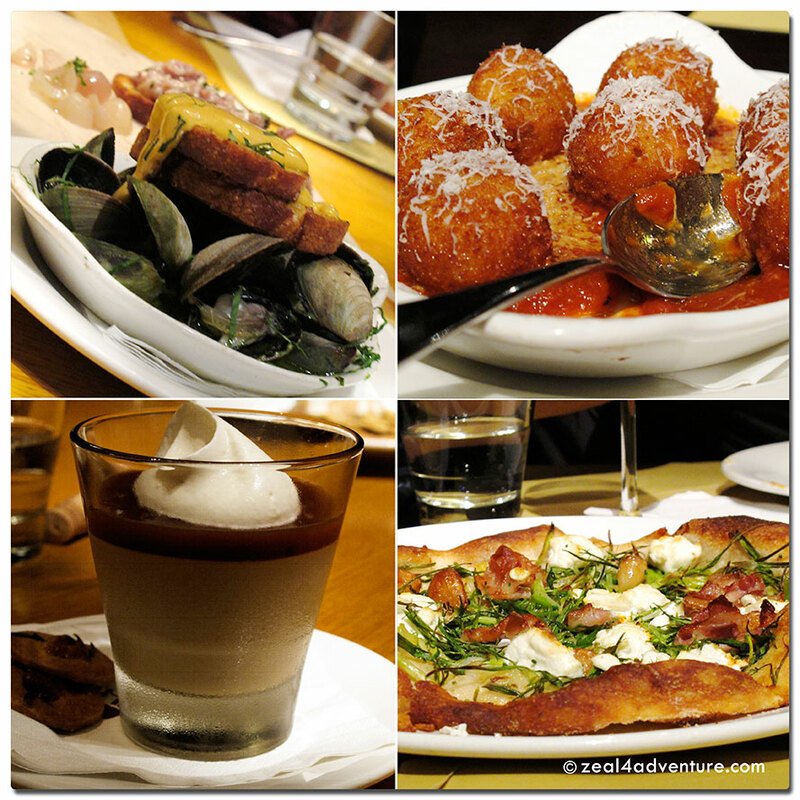 To save the best for my dad’s night, we dined with gusto at Osteria Mozza – a great choice to mark his 70th – he loves food more than all of us combined. 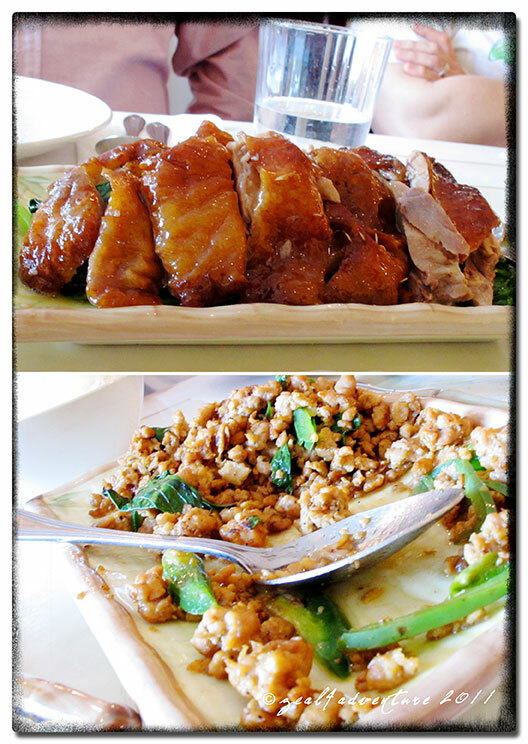 Wonderful French and Italian cuisines aside, we also had our share of chicken rice, but of course! 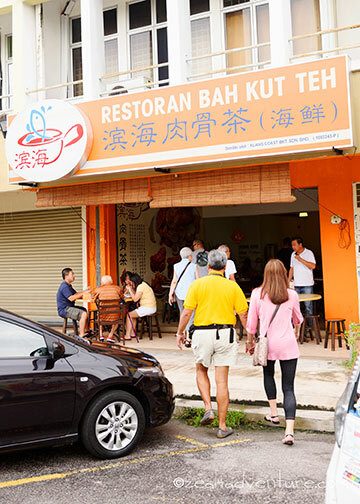 One day for lunch, we headed out to River Valley Road for an authentic Chicken Rice at Boon Tong Kee. The chicken rice here ranks high on the best chart. 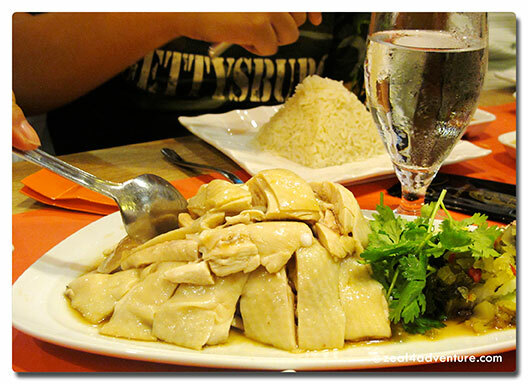 We ordered the steamed and the roast chicken and were not disappointed, the meat was tender and flavorful, the rice fragrant. Many tend to think though that BTK is over-priced and maybe it is. The chicken, although not disappointing, leaves no lasting impression, sad to say. To be in Singapore with kids and not go to Sentosa is a crime – at least to my 6-year old nephew. 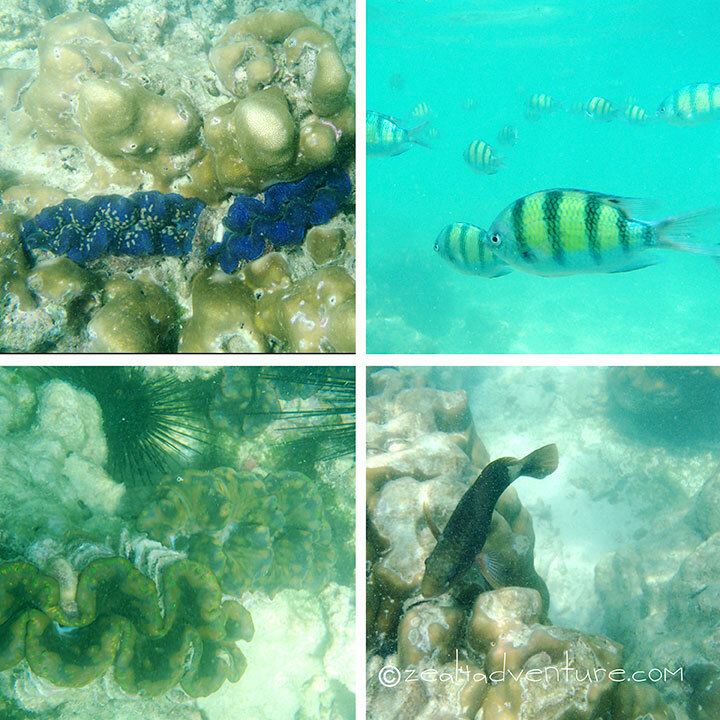 Not too large a place with an array of interesting marine life, Underwater World achieved to fascinate even (a kid at heart like) me. 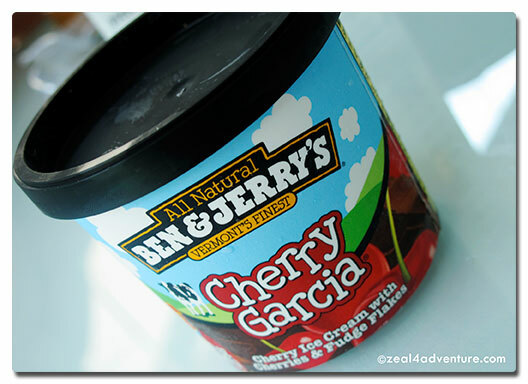 I sat through the dolphin show with a cup of Cherry Garcia’s at an air-conditioned café overlooking stage/pool. We stumbled on it when we went to get ourselves some Ben & Jerry’s and found out that we could stay and watch the show comfortably for a reasonable consumable fee. A great deal, if you ask me. My nephews were equally as happy with their own ice cream cups in their little corner with a great vantage point. The reason I love food so much is because I grew up in a family that enjoys good food. More often than not, trips with my parents always involved food, so I say this weekend Singapore fling was a hit despite some lows. Overall, we celebrated my dad’s birthday literally with a bang. Whenever I am in the US, my time with my cousin and good friend S has always been short – only a few hours for either lunch or dinner depending on how our schedules connect. 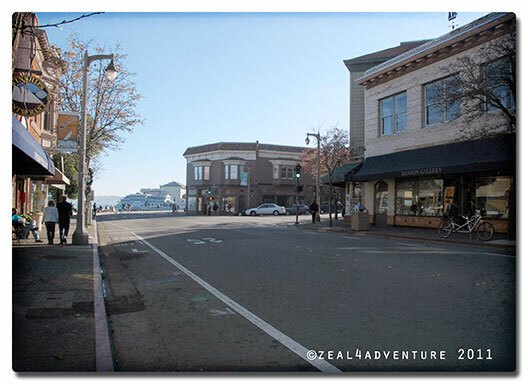 On my recent trip to the Bay Area, we made it a point to spend a couple of days together starting with a mini family reunion at her parents’ home in San Ramon and ending with lunch I immensely enjoyed in downtown Danville. Just 30 miles east of San Francisco, Danville, the heart of the San Ramon Valley was a pleasant surprise. 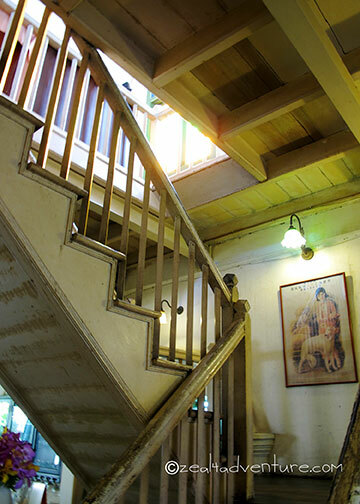 As with many towns, it features various interesting shops, art galleries and upscale eateries. 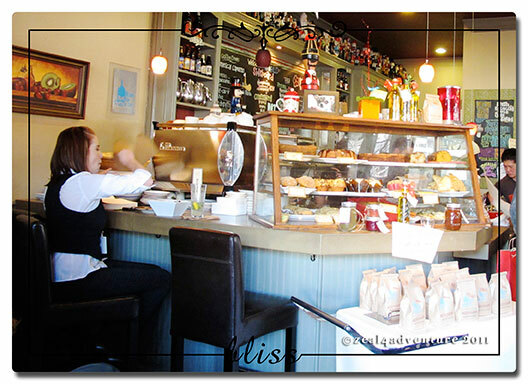 One such eatery is Sideboard, a neighborhood café at the old Danville Hotel. It spells quaint the minute I walked in with its charming French country décor. 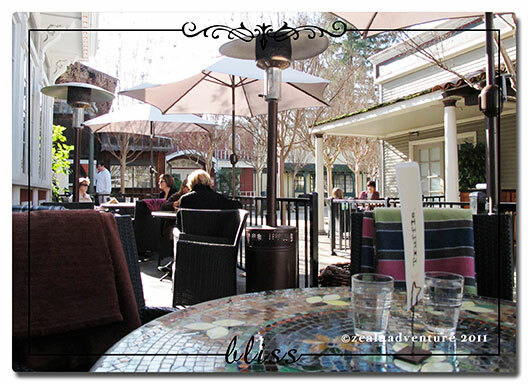 One gets a choice to dine on wooden tables and cozy chairs indoors or on the mosaic tiled patio tables outside – which we chose despite the chilly weather. A must try! 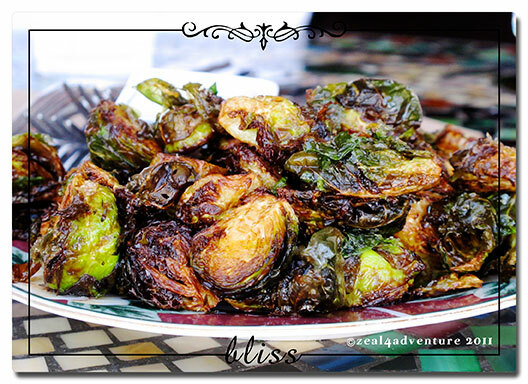 Fried Brussel Sprouts. One after the other, I just kept popping these gorgeously fried babies into my mouth. The best dish I had here. 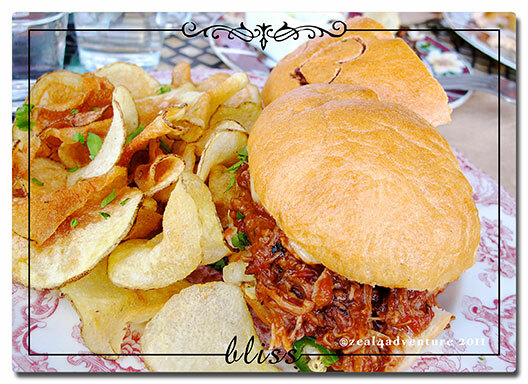 I went for the comforting Pulled pork sandwich while my brother chose this delectable bowl of Chili (a favorite of his). The scones, he said, went so well with the chili, he asked for second servings (of the scones), which Ford gladly gave. 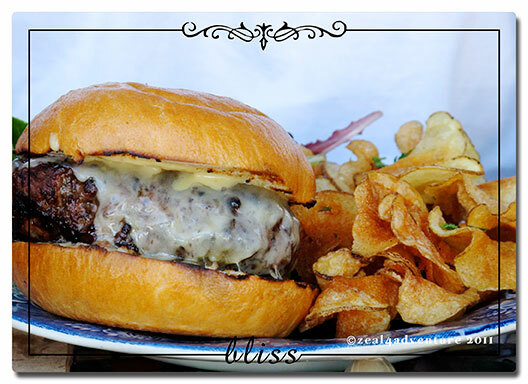 Also not to be missed is their famous burger made from Prather Ranch beef. 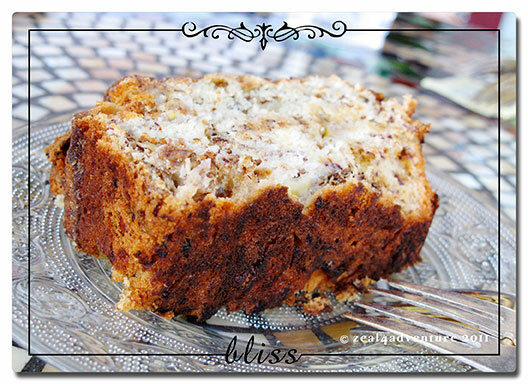 This homemade Banana bread and a mug of Blue Bottle coffee is the perfect cap to a wonderful lunch. My mom once told my dad while driving around Sausalito that it would be lovely to own a house there — overlooking the marina would even be lovelier. Gulp! 😯 I want one too. 😛 Its neighborhood oozes with charm, the steep wooded hillside on one side and the water on the other faintly reminds me of the Mediterranean, although Positano it isn’t. 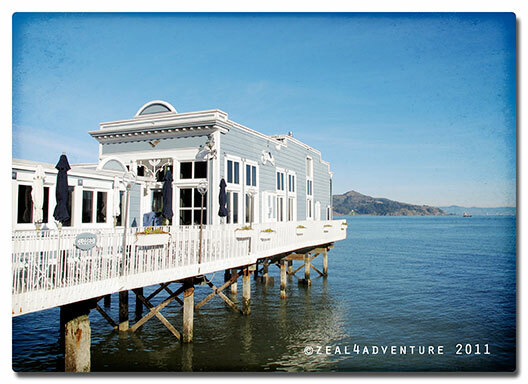 With the wide choice of restaurants from charming outdoor cafes and bistros to chic dining right on the waterfront, this endearing city of Marin County has captivated my heart since long ago. 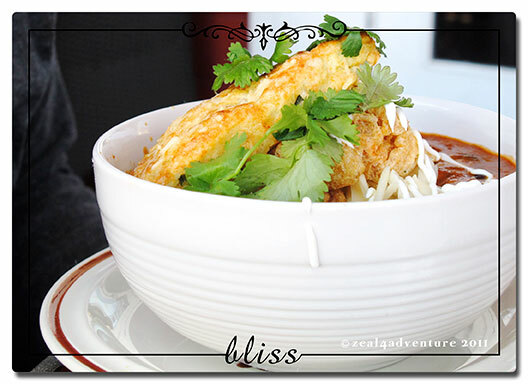 Yes, the food and the quaintness played a big role in endearing me to this town. We had a few days to spare before heading home to Manila and we decided that a beautiful lunch in a beautiful city is the best way to spend our last day with our chef-brother and Sausalito it was. 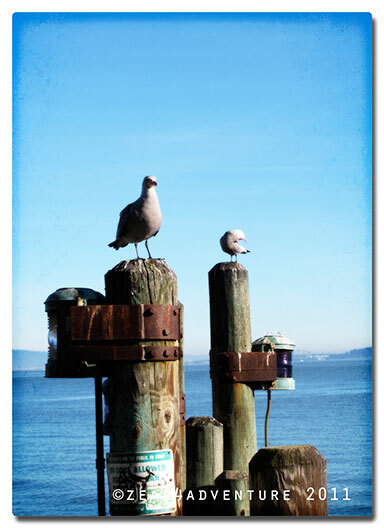 We got a table at Poggio, a classic Italian restaurant at the Casa Madrona Hotel and Spa overlooking the bridgeway and the Sausalito marina. 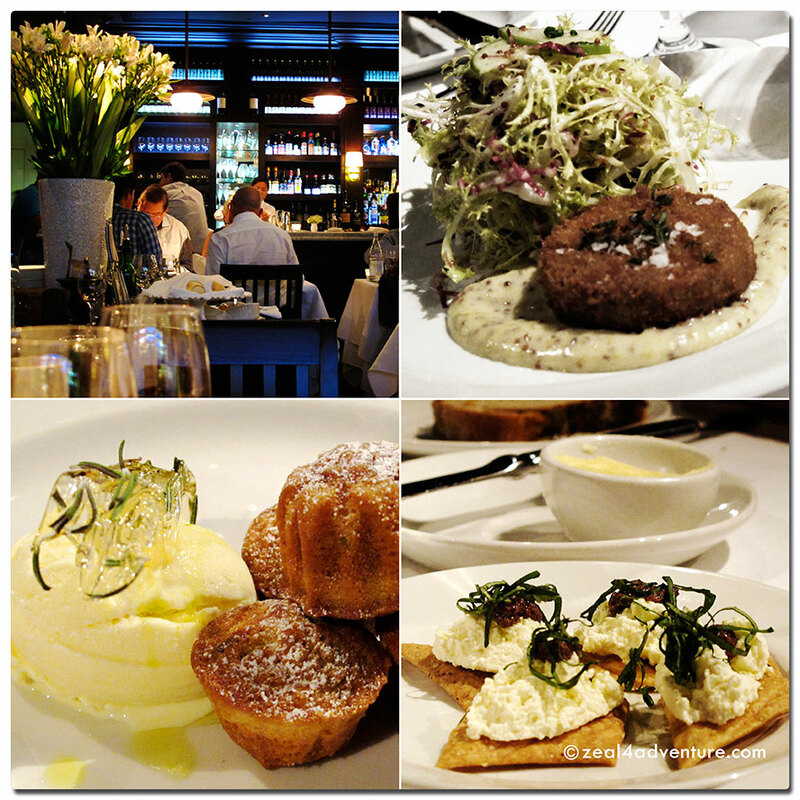 Chef Paul McNee’s menu featuring Northern Italian classics, changes daily. Rustic and soulful, he uses local ingredients and prepares nearly everything in-house from cured salami and prosciutto to fresh pastas. 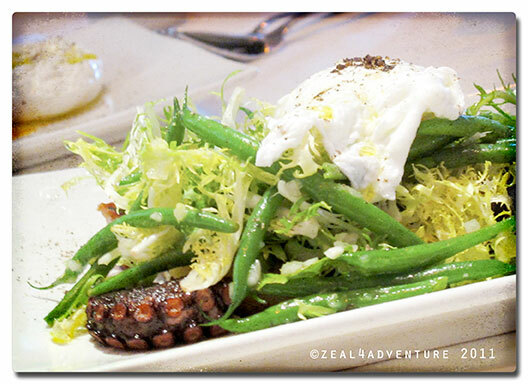 For our starter, we had this beautifully prepared Octopus with Pork Belly confit, frisée, french beans and poached egg. What an array of texture and flavor. 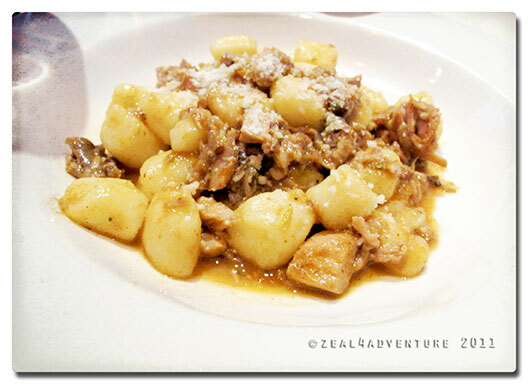 I had this light potato gnocchi tossed with a rabbit ragout – comparable in taste to our Chicken Adobo and the rabbit taste so much like chicken too. I wish I had ordered this. 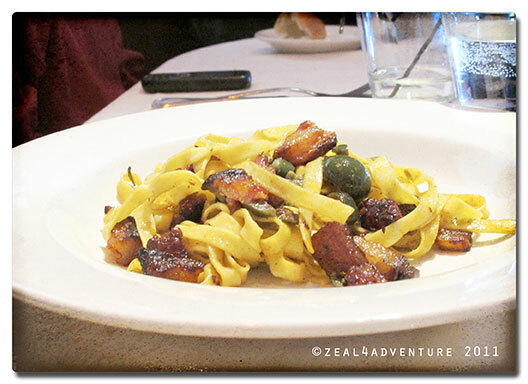 Tagliatelle with crispy pig face. A winner I tell you, I wanted to devour the whole plate, except that it wasn’t mine. Imagine large chunks of crispy pork with the fat melting in your mouth. And the olives and the chilies added more levels of goodness to this excellent dish. 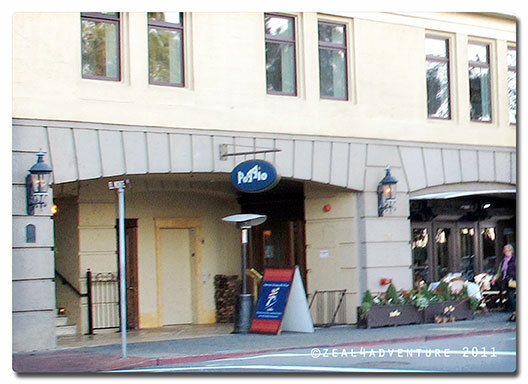 Incanto is a rustic Italian style restaurant in Noe Valley, an upscale neighborhood and home to many urban professionals with young families. It is not your ordinary Italian restaurant serving only Italian classics; there are always options on Incanto’s menu for the more adventurous gastronome. 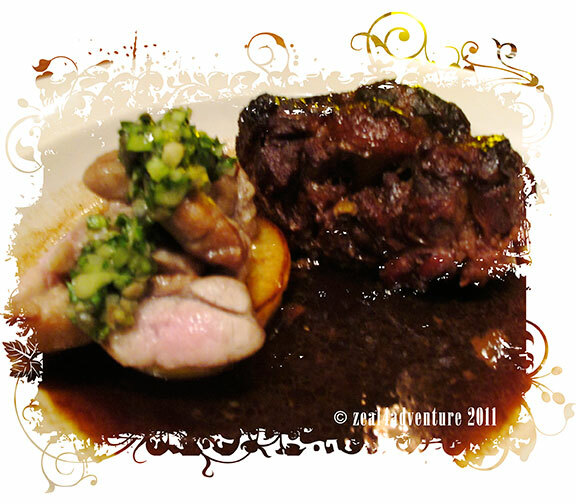 Executive chef Chris Cosentino of “The Next Iron Chef” fame is known for his “Offal” cooking as seen on his blog. And what is offal cooking, you may ask? It is a word derived from the slaughterhouse phrase “off fall” or the pieces that “fall off” a carcass when being butchered – Not limited to entrails but also includes the heart, liver, brain and lungs. In Filipino, laman loob and although not that uncommon in our cuisine, it has however only recently become recognized in the “foodie” community of America. A restaurant find like this is not unthinkable especially if planned by my chef-foodie brother. 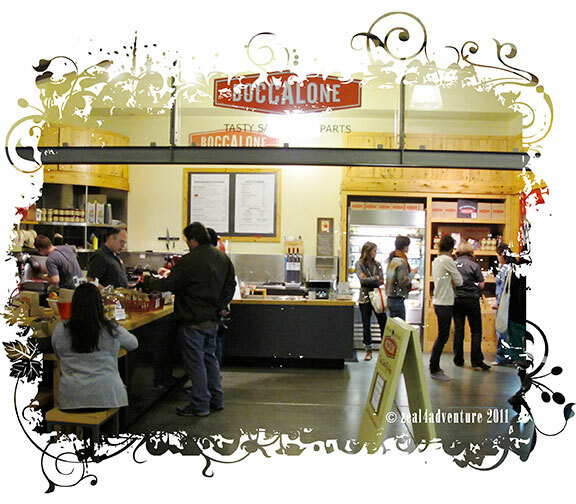 A lighted showcase of Boccalone goodies greets you as you enter the cozy, rustic restaurant, which instantly stole my attention and eventually my heart. We were early for our reservations so I had time to study the menu and noted that they had more Italian classics than offal offerings, which is probably more sensible in the end as adventurous gastronome, albeit growing, is still just a small population and probably more so in the US. We started with these beautiful breads, which are wonderful with the tapenade. 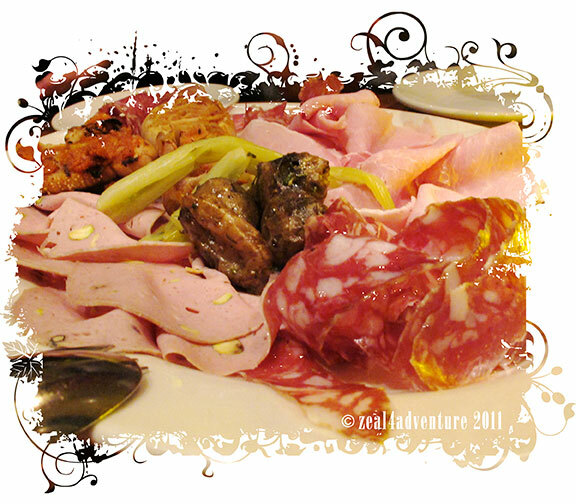 Anyway, for our starters, we ordered a Boccalone Salumi Platter in Boar. Not really understanding what “boar” stood for until we saw this huge platter in front of us. The options on the menu were Piglet, Sow and Boar; apparently it was describing the size of the platter. 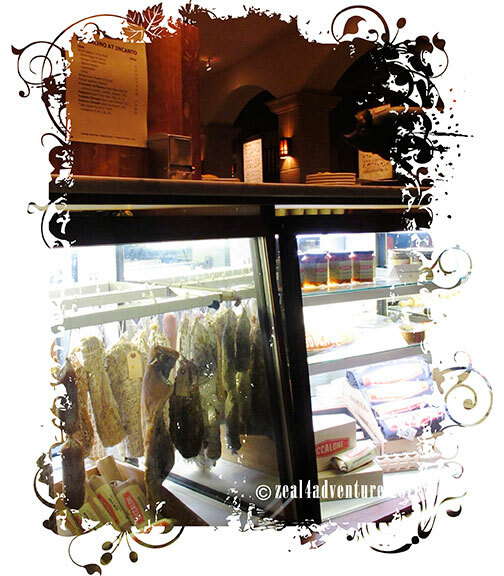 Hearing so many good things about Boccalone Salumeria, I wasn’t worried about it. The 4 of us devoured almost everything on the platter. I loved it so much, on my last day of this trip, I went to their store at the Ferry Building and brought home some Nduja and Brown Sugar & fennel Salamis. Needless to say, they’re awesomely good! 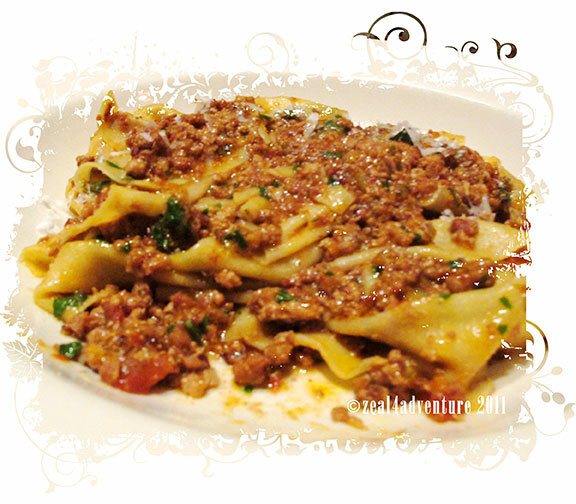 My brother had this Handkerchief Pasta and Rustic Pork Ragu, which I found delightful. This is the classic dish while mine was more offal. It’s Oxtail, Sweetbread with Rutabaga and Dandelion Salsa. Oxtail is pretty common in my part of the world and as one would expect, I enjoyed this dish a lot. It was tender, the salsa added crisp texture to the sweetbread, which is not a favorite if truth be told and I’ll take kidney or even brain over it. Sweetbreads are the thymus and the pancreatic glands of young cows, lamb or pigs. And then there was dessert! 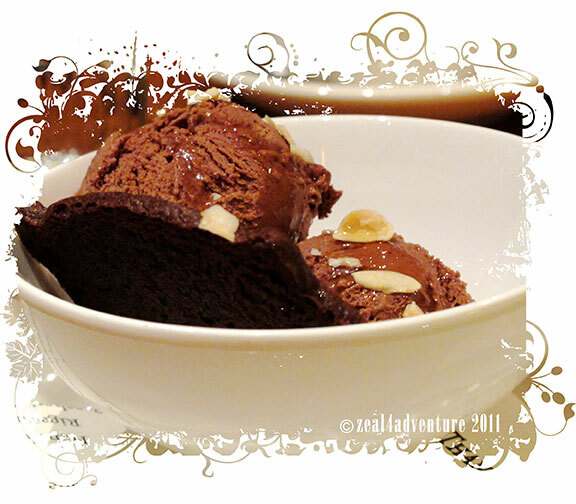 Chocolate-Nduja ice cream and almonds – my choice as I am so into ice cream (or anything sweet for that matter) infused with some sort of savory flavor nowadays. Nduja (en-doo-ya) is a spicy spreadable salami. I have to say, the spicy, salty salami brought this chocolate dessert to another level. 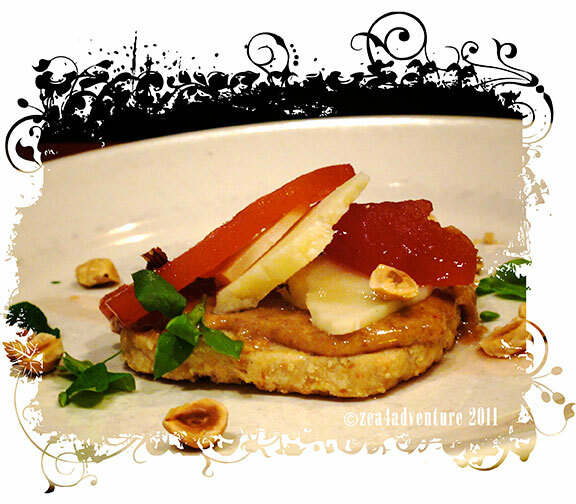 Quince, Pecorino, Moliterno and Hazelnut butter. 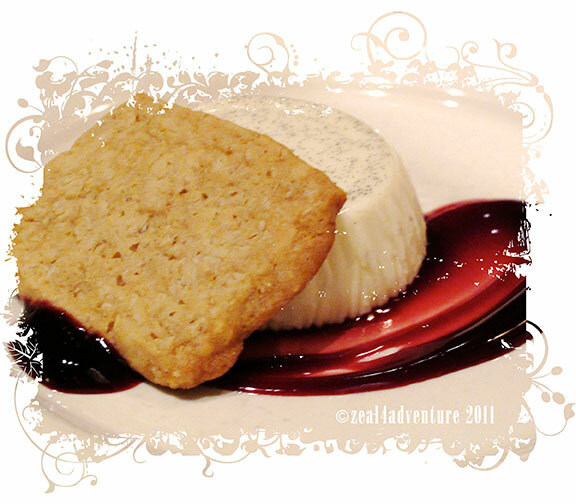 Myrtle Panna Cotta and huckleberries. Two-thumbs up! 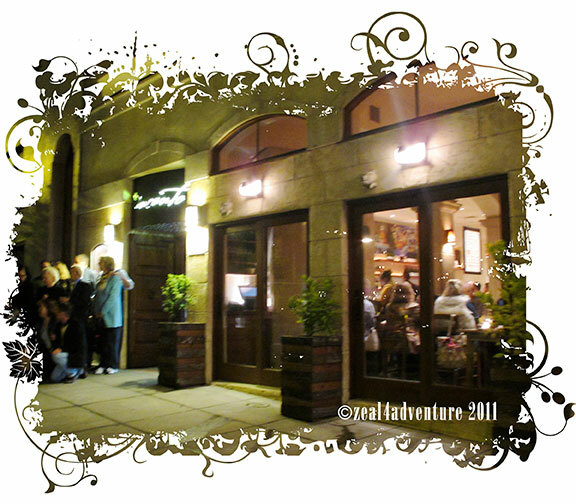 If you find yourself in the neighborhood or somewhere near the neighborhood and if you want to add to your gastronomic adventures, include Incanto and/or Boccalone in your list of must-tries. For a short while I called San Francisco home. Straight from a pampered life, away from the watchful eyes of my parents, living (not exactly) alone in the Richmond District was uncharted territory (for us then). Albeit a carefree time of my life, it was there that I learned independence and self-reliance. It was one of the best times of my life. 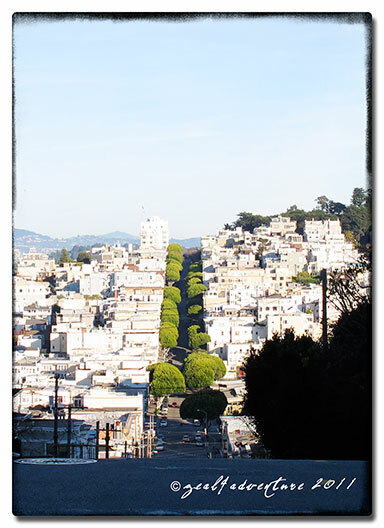 I don’t return very often but I recently found myself back in San Francisco again and again. Although our visit was mostly because of work, my brother and I managed to squeeze in some time for family, friends and some reminiscing. I likewise seized the opportunity to spend precious time with my brothers – one arrived with me and was my roommate then, the other met us there from Louisiana where he now (temporarily) resides. The bar escapes the need for reservations. 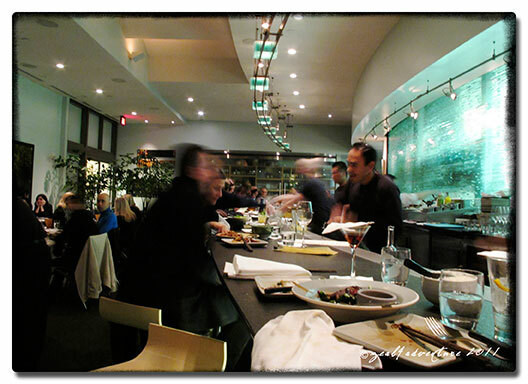 We met up with friends at the Slanted Door lounge bar no sooner than we landed. 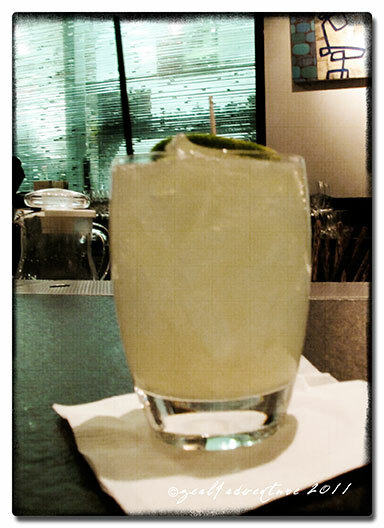 Having Slanted Door’s signature drink: Ginger Limeade with Hangar One Kaffir Lime Vodka. passed by our old apartment and had lunch at our favorite hangout. 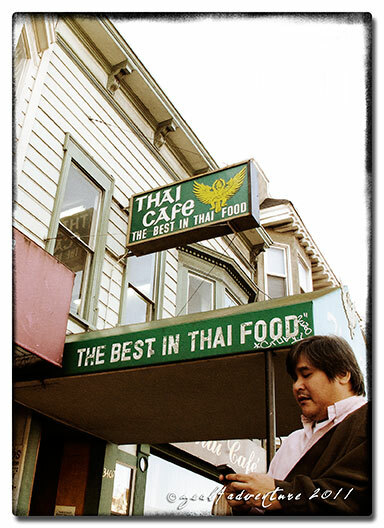 Thai Cafe along Geary St. has good food at student-friendly prices thus a favorite hangout. That weekend we spent a lot of time visiting old-time favorites. 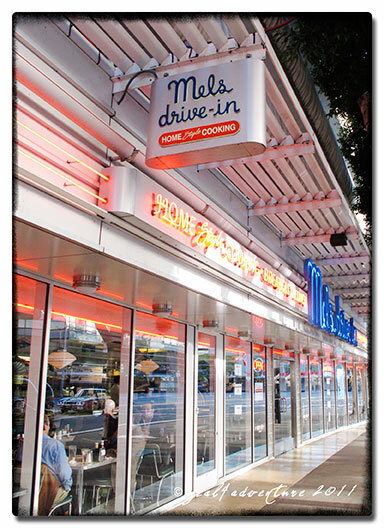 Breakfast at Mel’s Drive-in Diner. 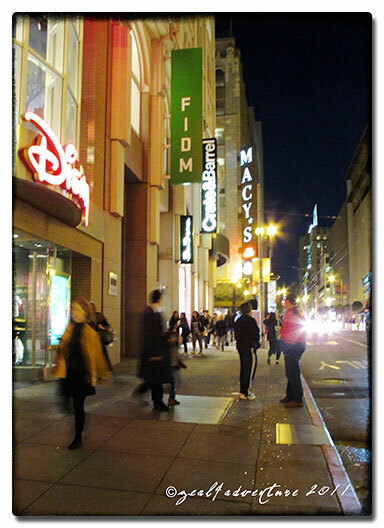 Although many of those who stayed behind after school moved out of San Francisco, they remained within the Bay Area. Some still lived in the same house we used to hangout in. 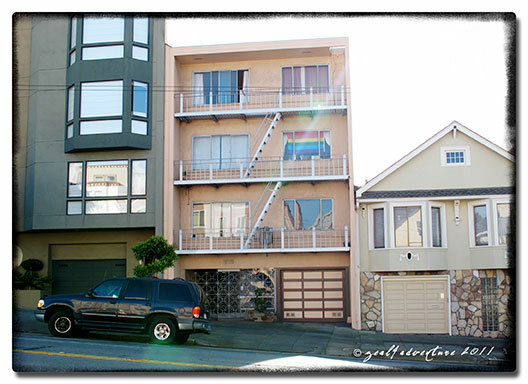 Once you’ve lived there, you can’t really shake San Francisco out of your system, can you? Stockton St. I used to walk this street a lot (in daytime, or course) to go to school. It was an awesome weekend reminiscing about the juvenile things we’ve done and had gotten away with. How we survived those reckless years was a miracle. Ah to be young again… even for just a weekend.